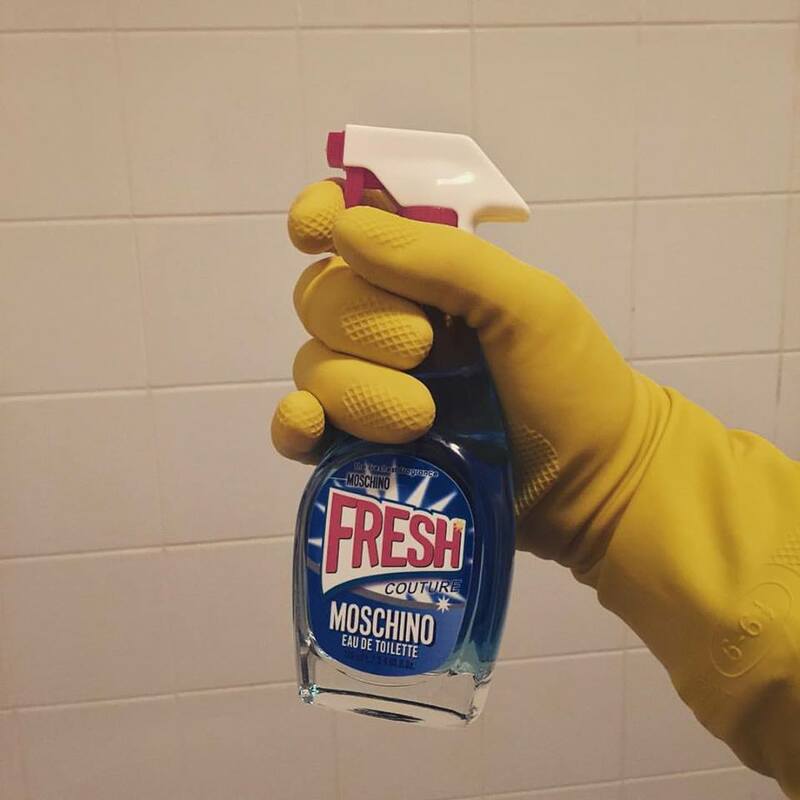 It’s time to put on the Marigolds and start scrubbing because the new fragrance from MOSCHINO is here, and it’s very much channelling spring clean couture. The concept of this eye-catching new scent, the superbly named ‘Fresh Couture‘, is an interesting one. Packaged within the familiar form of an everyday household item, namely a bottle of spray cleaner, Fresh Couture has been created to “juxtapose the most mundane and commonplace of all products, the household cleaner, with something so precious – the juice of a luxury brand’s fragrance”. It is this “dichotomy of high and low”, i.e. the luxury of a fragrance and the value-lacking vessel of a functional cleaner, that is Fresh Couture’s inspiration, and it’s served with Creative Director, Jeremy Scott’s playful signature. Unlike MOSCHINO’s other kitsch fragrance, the cute teddy bear that is ‘TOY‘ (all style and no substance, as much as I hate to admit it), Fresh Couture is delivered with a definite concept behind the juice. The whole thing plays, unsurprisingly on the idea of freshness in a feminine way boasting notes of citrus, flowers and woods. What could be more MOSCHINO than a “surprising and ironic perfume”, says the brand, and whilst I may not be on board with the idea of this being surprising or ironic, I’m perfectly happy to concede that Fresh Couture says ‘MOSCHINO’ right from head to toe. I should mention that it’s also quite a bit of fun, too. Fresh Couture starts out fresh and sweet with the zingy air of squashed citrus fruits. It’s not salty or ozonic, as the Harpic-blue shade of the juice may lead one to think, nor is it minty-fresh or lemon-scented mountain air, whatever the ‘in’ scents for cleaning products are these days. This is no toilet cleaner, I’ll have you know, it is, in fact a rather modern floral that plays with the idea of clean, but presents it in a pretty way that is more fashionable than functional. The heart is a gentle melange of roses and abstract white florals. The general impression is of sweet laundry musks and supple greenery, with a pale mix of jasmine and orange blossom at the very core. The fruitiness is intensified by the jam-like spirit of osmanthus, which is lacking the hot white floral effect here, simply providing a soft and sparkling glaze of sugary citrus. Fresh Couture feels at its most easygoing and wistful at this point, exuding a breezy, spring-like feel that is pleasant and enjoyable. In the base, Fresh Couture thins and softens into a juxtaposition of creamy woods and airy ambrox. The whole thing feels spotlessly clean in the base, almost as if the fragrance has spent a good few hours scrubbing the floor to make sure the tiles are spotless for the arrival of the base. “Out, damned spot” says Fresh Couture as it sanitises everything in sight and the general impression is soft and every-so-slightly fruity sweet wth just a touch of something peppery for good measure. The whole thing is entirely pleasant to wear and I must admit that the ridiculous bottle is just so fabulous that it makes the experience entirely more joyful. Fresh Couture is exactly what one expects it to be, and I imagine that this was precisely the point. It is a standard, fresh and clean musky floral, but completely unlike something one would find in a cleaning product (it definitely isn’t as harsh or cheap), packaged within something entirely functional. The irony isn’t there in the juice though, and it would be fair to say that Fresh Couture isn’t any form of intelligent piece of niche design, like a filthy animalic in a ‘clean’ bottle, for example (wouldn’t that have been a hoot? ), but it is literal without being wholly dumb and uninspired. Yes, it will sell based on the bottle alone, but thankfully, Fresh Couture does have something more to offer than just kitsch, and that’s a dazzling touch of domestic chic. MOSCHINO Fresh Couture is available in 30ml, 50ml and 100ml (£70) Eau de Toilette. In the UK it is currently exclusive to Selfridges. Sample, notes quotes and image 1 via Moschino. Image 2 is my own. Posted in Feminine, Floral, Fruity, MOSCHINO, Perfume Reviews and tagged Fragrance, Fresh Couture, Jeremy Scott, MOSCHINO, Parfum, Perfume, Perfume Review. Bookmark the permalink. That bottle is hilarious. I can imagine pulling the trigger brightens up a bleary winter’s morning. The scent is perfectly fine. No great shakes but much better than the disastrous TOY. Is that Linda Evangelista in the ad? SWOON! It sure is. She is a goddess! New reader here- so glad I stumbled across this blog, LOVE your writing!! Your descriptions are perhaps just as fabulous and satisfying as sniffing the juices themselves. Thank you, Lauren. It means so much to hear that. Hi there…just wanted to give you a Big shout out…Lovely blog! The layout has a very fresh and clean feel to it and we share the love for perfumes!